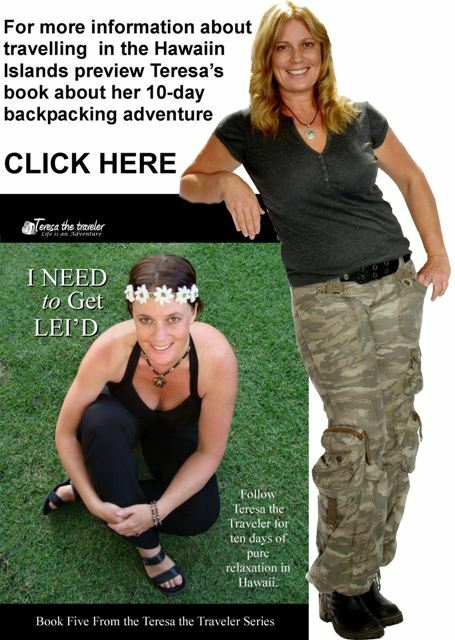 Excerpt from I Need to Get L'eid from the Teresa the Traveler series of books. My original plan was to return my car first thing in the morning, check out of my room and catch a plane to Maui. Francine, one of my Facebook friends, informed me that she was in Maui with a friend and invited me to go zip lining with them. I looked online to see if there were any shark cage tours in Maui but there wasn’t. I had shark on the brain and was determined to swim in a shark cage before I left Oahu so I called the airline and booked myself on a later flight giving me enough time to catch the 7am shark tour. I got up at 5 am and, with the help of the GPS navigator my parents bought me, made my way back to Haleiwa. The same shark boat I checked out the day before was getting ready to depart for their morning tour and, as luck would have it, just happened to have enough room for me. Look out sharks, here I come! Our group consisted of a couple of young newlyweds and a soldier and his father. We drove a couple miles offshore into the shark infested waters. Unlike other shark tour companies around the world, North Shore Shark Tours does not bait the sharks. Rather they bring their guests to areas that have just been fished. The fishermen throw the fish waste into the water which attracts large groups of shark. The newlyweds were the first to enter the “shark tank”, which proved to be quite comical since the husband did not know how to swim, was afraid of the water and even more afraid of getting eaten by a shark. The sharks circling the boat only worsened his fears. I tried to contain my laughter as I watched the guide and the captain coax the frightened man into the cage. Once they finally managed to get him in the water, they had to convince him to make his way to the back of the cage so they could let the lines out. I have to give the guy a lot of credit, he somehow managed to overcome his fear and spend the next 20 minutes clinging to a cage with numerous 5 to 15 foot sharks circling around the cage. For an extra fee, guests can purchase a DVD of them in the cage. Even though I had an underwater camera, I jumped at the chance to get extra footage. As the captain was reeling the newlyweds in, the guide started filming me. He warned me not to pet the sharks because they might mistakenly think I was offering them my arm for lunch. He also told me not to look them directly in the eye because they take that as a sign of aggression. My eyes widened and my jaw dropped...The guide started to laugh and, much to my relief, I realized he was only kidding. Thank God because I had no idea how to look at a shark without making eye contact. The couple got out of the cage and sat at the front of the boat with a barf bucket. It was windy and the choppy waves were wrecking havoc on everyone’s stomach. My heart was pounding so fast it was hurting my chest as I lowered my body into the cage and clung to the bars. The soldier and his father got in the cage with me and, as they let out the lines and the boat got farther away, a scary thought entered my head. I realized that it was impossible for the sharks to get into the cage but what was stopping them nibbling on my knuckles which had turned white with fear. I managed to convince myself that my knuckles were not very tasty and there were two other people in the cage who would make better shark snacks than me. When we got into position, I just stood there like a deer in headlights watching fins circling around us while music from the movie Jaws ran through my head. Dun dun dun dun...dun dun dun dun. The guide kept trying to get my attention and when he finally did, he motioned for me to utilize my mask and snorkel. Duh! Why didn’t I think of that? When I finally looked under the surface I was completely in awe. Around 10 to 15 sharks swam gracefully around us. They seemed as curious about me as I was of them and none of them looked the least bit interested in snacking on my knuckles. When our 20 minutes was up I was happy to return to the boat. The water was rough and my body was done getting jarred around. The next time I go on a shark adventure it will be as a PADI certified diver in a submersible cage where the water is calm. Maybe I will fly to Australia and go on a three-day great white shark adventure with Rodney Fox. How cool would that be? We headed straight back to the marina because the waves were getting larger. The afternoon departures would definitely be getting cancelled again. I was so lucky to make the first tour. The ride back was sombre to say the least. The newlyweds clung to each other trying not to hurl while the soldier sat there white as a ghost trying to keep it in. The father was not so lucky, whatever he ate the night before was quickly making its way into the ocean as he kneeled on the deck of the boat with his head hanging over the edge. I on the other hand was feeling pretty good. The exhilaration of my shark encounter must have helped ward off any sea sickness. I spent the ride back chatting with our guide about why Shark Fin soup and shark finning should be outlawed. This was the first I had ever heard of the Chinese delicacy and the inhumane way in which its main ingredient is obtained. Shark Fin soup has been popular in China since the Ming Dynasty where it was usually served at special occasions. As the Chinese middle class became more affluent, the demand for Shark Fin soup, which can sell for over $100 US a bowl, rose. Today Chinese restaurants all over the world sell the popular delicacy. Believed by some to be an aphrodisiac that slows aging, the soup is actually hazardous to your health. In his 2005 China Daily article Liang Qiwen writes, "Shark fin may cause sterility because of mercury and other heavy metals contamination." He goes on to say that consumption can cause central nervous system problems and kidney disease. Pregnant woman and children are strongly advised to refrain from eating shark fins. Hong Kong accounts for over 50% of the demand for shark fins. Their major suppliers come from Europe, Taiwan, Indonesia, Singapore, United Arab Emirates, United States, Yemen, India, Japan and Mexico. According to Julia Baum, a fisheries biologist at Dalhousie University in Halifax, "Large sharks have been functionally eliminated from the east coast of the US, meaning that they can no longer perform their ecosystem role as top predators. With fewer sharks around, the species they prey upon - like cownose rays - have increased in numbers, and in turn, hordes of cownose rays dining on bay scallops have wiped the scallops out." I love seafood and I would hate to see scallops and lobsters become extinct but killing sharks has even worse consequences than that. Have you ever heard of a thing called phytoplankton? Phytoplankton obtains energy through photosynthesis, a process that converts carbon dioxide into organic compounds releasing oxygen as a waste product. In other words, phytoplankton eats up CO², the stuff that causes global warming, and turns it into O², that stuff we breathe. Fish and other sea creatures eat phytoplankton for breakfast, lunch and dinner. What do you think happens when there are no sharks around to eat the phytoplankton feeders? They eat it all until there is none left to make oxygen. Yikes! The world’s shark population is thought to have declined by 90% in the past few decades. Canadian crusaders like filmmaker Rob Stewart and animal rights activist Paul Watson are fighting to stop this massacre and fortunately they are not alone. As more people get educated they are taking action to save our planet by saving the sharks. Protesters worldwide have been lobbying to get shark fin soup taken off the menu and stop the legal and illegal shark fin trade through education and legislation. The possession, sale and distribution of shark fins are about to be prohibited in Hawaii much to the delight of native Hawaiians who have fought long and hard to ban this cruel practice. I guarantee you will never see Teresa the Traveler eating in a restaurant or shopping in a store that sells shark fins. I really love oxygen and if I need an aphrodisiac, I’ll have a glass of wine – no shark has ever been killed in the creation of wine!